Located in the heart of Italy and immersed in its beautiful nature, at the border between Umbria and Tuscany, on Lake Trasimeno, this imposing villa offers cultural and various other attractions to all its guests, of all ages. 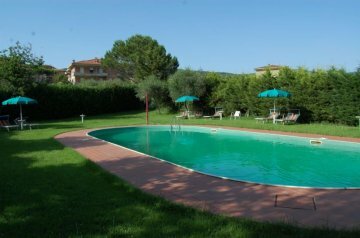 The residence is a stone's throw away from Cortona (a famous Etruscan town), and impressive art cities such as Arezzo, Perugia, Siena, Gubbio, Assisi, Orvieto, etc. are also easy to reach from here. The villa is very much suitable for families, it is surrounded by vast open spaces, it has a large garden (of over 40 meters in width and 60 meters in length) with blooming trees and various plants; there is a beautiful swimming pool (14m x 7m) placed among the greenery, within a walking distance from the sports facilities here. The house has three floors and its surface has been divided into several newly built apartments. Upon entering the building's large door you will find a marble staircase leading you to each different floor. Then there are three doors, one on each floor for each apartment. On one side of the house, a small alley allows cars to access an underground parking. Each apartment has a large furnished terrace with two hammocks, a sun lounger and a sun umbrella. The owner also has a large garden which can be used by guests. In the basement there is a washing machine for common use. The property is suitable for groups as well since it has a capacity for a maximum of 30-40 pax. The house is situated on the outskirts of Tuoro sul Trasimeno. You can walk to the shops as well as to the beach in just twenty minutes. Nearby, in the street, there is a large parking lot. The building is 5 minutes walk from the town center (post office, bank, butcher, bakery, grocery, etc). Not far away lies the small port of Borghetto. This fishing village is situated directly on Lake Trasimeno. Here you will find a tower and a church which are both more than 1,000 years old. Within a short drive you will find picturesque villages and towns of great historic interest and beauty. Examples include Cortona (13km) in Tuscany, a beautiful medieval town of Etruscan origin. It was built upon one of the oldest hills in Tuscany. It's rich array of streets help make it one of the most fascinating cities in the region. Here you will also find numerous museums, antique shops, restaurants and cafes. The city is known worldwide for being the backdrop to some scenes in the Oscar-nominated film "La vita è bella" by Roberto Benigni. Another interesting town is PASSIGNANO. Its medieval center is accessible only on foot. From the medieval city center you have a beautiful view of Lake Trasimeno. CASTIGLIONE SUL LAGO is another old, medieval town. The narrow streets, gates, courtyards and trattorias give the village a typical Italian atmosphere. Perugia is located 40 km away and with it's labyrinth of streets, alleys and monuments, attracts a host of visitors each year. Assisi, Arezzo, Orvieto, Spoleto and Siena are a few other tourist destinations that can be easily reached within an hour by car. Even Rome and Florence are accessible in just over an hour by train. This apartment is located on the first floor and has an area of approximately 45m². It is suitable for two to three persons and consists of a bedroom, living room, kitchen and bathroom. The living room has a single sofa bed. The kitchen is equipped with a 3-burner gas cooker, kettle, fridge/freezer, electric oven and coffee maker. The bathroom has a bathtub with shower, a toilet and bidet. The bedroom is furnished with a double bed. There is a balcony with a beautiful view. All apartments have central heating, are well furnished and come equipped with a television. Arrival is between 3:00 and 7:00 pm; departure is by 10:00 am. INCLUDED IN THE PRICE ARE: Kitchen equipment - Gas / Water and Electricity - Swimming pool with adequate chairs and parasol. NOT INCLUDED IN THE PRICE ARE: - Bed and bath linen, 10.00 euro/person/week - Final cleaning, €40.00. Heating will be calculated according to consumption (upon request). This costs €70.00/week. The pool is normally open from April 28th to September 29th, unless the weather allows the pool to open earlier and/or close later. One pet is accepted but only on the ground floor.